Changes in the legislation in states like California have made dependence upon solar energy, not only more appealing, but a requirement. California is specifically pushing hard for rooftop solar installations. Rooftop solar installations mean exposure to fall hazards. Fall hazards increase when solar panels are installed for a number of reasons. More workers on the roof more often. Solar panels on roofs means that people need to install and maintenance those units. That means that people will be on the roof more frequently in a working scenario. Squeezes people into tighter spaces around things like skylights and roof hatches. Workers have less room to negotiate the hazards making them more dangerous. Introduces more trip hazards. With more equipment and power lines on the roof, so increases the trip hazards that are present. All these factors underscore the necessity of proper fall protection when working on a rooftop solar installation. Roof Edges What are you using to protect the roof edge? 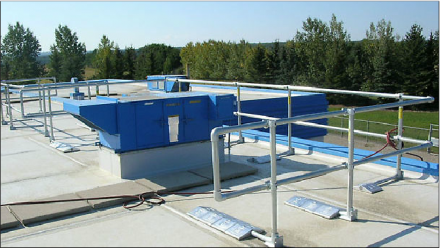 Any equipment that is closer than 15 feet to a roof edge must be protected. These should be protected by a guardrail or the worker should be tied off properly. Skylights OSHA considers a skylight a hole! (reference) Most skylights cannot support the weight of a person falling into it. They are brittle and many people have been killed by stepping into one and falling to the floor inside of a building. 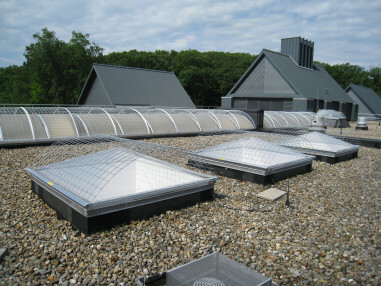 Skylights should be covered with a screen or surrounded by a railing to ensure proper work safety. 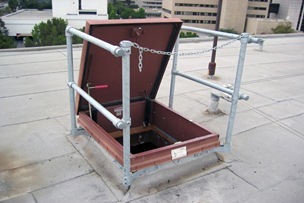 Roof Hatches Entering and exiting, as well as working around roof hatches call for fall protection measures. The proper grab bars and roof hatch railings should be installed around the roof hatch. 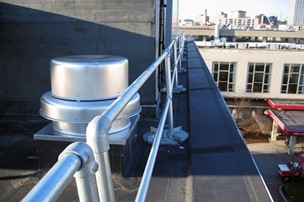 This railing is a non-penetrating, counterbalanced solution that can be installed on almost any roof surface. 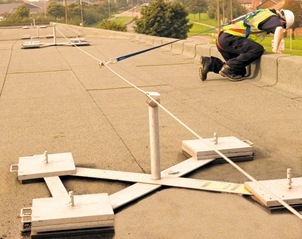 It can be used to protect the roof edge or to protect around skylights or machinery. 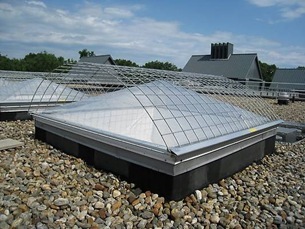 Our skylight screens are non-penetrating and clip onto the edge of the skylight. California has additional requirements for skylight screens and we also provide screens that meet the CalOSHA requirements. 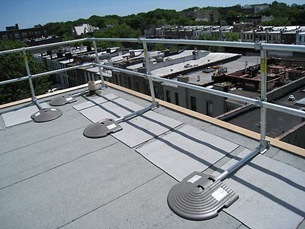 Kee Hatch Roof Hatch railings can be installed by bolting the railing unit to the side of the roof hatch. This is a non-penetrating railing solution that is designed to be more temporary in nature. As a last resort you can use lifelines to protect employees who are working on a rooftop. Our sales team can give you expert advice on what products to use in each fall protection scenario. Give us a call or drop us an email with your questions and well respond promptly.